Use low beam headlights when driving in rain, snow, sleet, or fog. High beam headlights in adverse weather conditions lower visibility by reflecting off the precipitation and back into the driver's eyes. 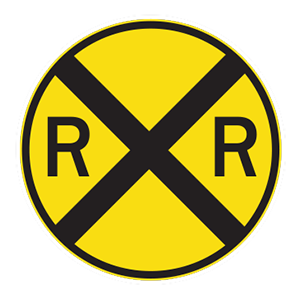 A round sign always indicates that you are approaching a railroad crossing. Any lane (as long as it is safe). The lane closest to the left curb. The lane in the center of the road. When turning left from a one-way street onto another one-way street, you should begin the turn from the far left lane. What should you do when an emergency vehicle is approaching you while displaying flashing red or blue lights? Pull to the right side of the road and come to a complete stop. Continue driving, but stay out of its way. Try to reach your destination before the emergency vehicle catches up to you. Arkansas law requires motorists to move over for approaching police cars, fire trucks, and ambulances using their sirens and flashing lights. Drivers should pull over to the right edge of the road, or as near to the right edge as possible. If you are in an intersection, drive through the intersection before pulling over. Come to a complete stop, yield to oncoming traffic or pedestrians, then proceed. Reduce your speed and proceed with caution. Come to a complete stop and remain stopped as long as the light is red. Treat a flashing red traffic signal the same as you would treat a stop sign. Come to a complete stop, yield to oncoming traffic or pedestrians, and proceed when the way is clear. If your vehicle begins to skid, do not use the brakes. Braking could make the skid worse. Letting go of the steering wheel. Pressing your head firmly against the head restraint. If your vehicle is hit from the rear while you are in forward motion, your body will be thrown backward. Press yourself against the back of your seat and put your head against the head restraint to prevent whiplash. Maintain a firm grip on the steering wheel and be ready to apply your brakes to avoid being pushed into another vehicle.